Fatima is from Lafta Farawayne, she has lived there all her life. When we met her she was sitting under the tree in the shade, it felt as if she spent most of her days there in the same spot, she was quite frail and unable to move very far. Although her bones were fragile, Fatima had a strong look about her and the most infectious smile, making us feel very welcome into her home. Fatima has five children, two girls and three boys. She lives with her youngest daughter Rahma who looks after her, the rest of her children had all left and have families elsewhere. Rahma has ten children, they live in separate houses next to each other. There houses are built with sticks, twigs and bush from the land they live on neatly bound together, and 2.5kg empty tin cans that have had the tops and bottoms taken off then flattened out to make a wall. Draped over the frames of their homes are beautiful patchwork roofs, made from different materials that have been collected over the years and stitched tightly together. 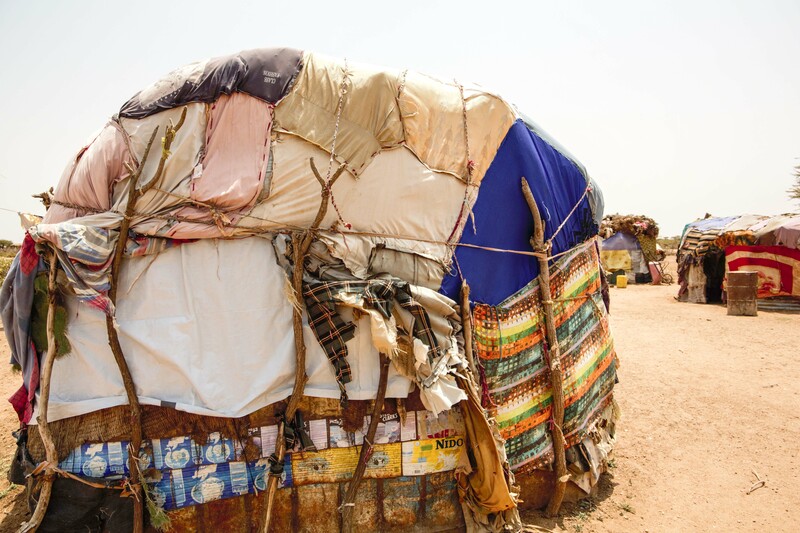 These materials include bed sheets, carpets, scarfs and even old jeans, they are very impressive shelters. Fatima told us that the drought had hit the family hard and they lost everything: “We are farmers, we used to farm the land and produce crops for food, but due to the lack of rain over the recent years, we didn’t have any products from the farm. We no longer have livestock either. We used to farm maze, sorghum (a sweet grain), beans, potatoes, and even watermelon, now we can grow nothing. For the last three years we have tried to grow crops but the land has given us nothing.” Now that Fatima and her family can no longer grow crops, they depend entirely on aid from the government and NGOs. I was very happy, everything has been very useful. We used the materials for building our house, we use the utensils for cooking and eating, and many other things. 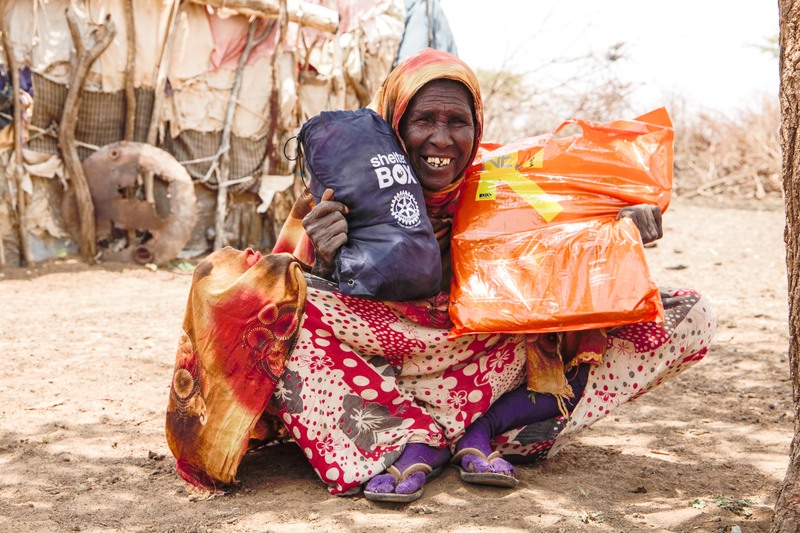 Like most of the families who have received a ShelterBox in Somaliland, Fatima uses the box itself for storage. “At first we used it to put our cooking items in, but now we store our clothes in it,” she said. Fatima has found the solar lights extremely useful as well, she pointed to one of the solar lights that had turned a burnt orange colour from harsh weather and sand storms. It was tied onto the side of her home directly in sunlight. “At the moment they are charging, we use them in the night as torches when we go to see our neighbours. They are really useful but we need bigger ones.” Whilst telling us this, Fatima was laughing and making big circular motions with her hands, gesturing the size of the solar lights she wanted. When asked about the water filter she said: “Yes we use it and it makes the water very clean.” They have a borehole nearby but it has dried up so they have to buy the water. We use the materials and they are helping us, we are very grateful. We hope you are doing good and we hope for good things for you.